When I was contacted about reviewing new pistol sizing and recapping dies I thought, “wow….dies. Big deal”. What are these S3 Reload dies anyways? 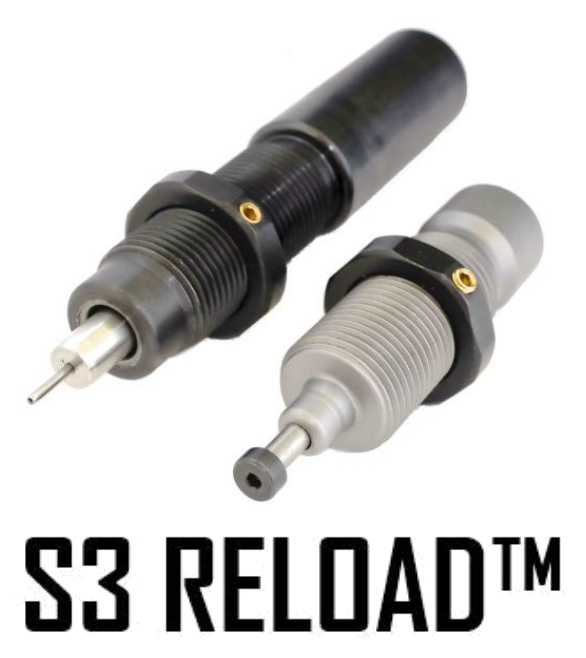 Shell Shock Technologies (SST) of Westport, Connecticut has created the S3 RELOAD set; dies not just for “regular” brass, but designed to accommodate the NAS3 casings (their nickel alloy casings for small caliber pistols). A week later I picked them up (along with a huge bag of the NAS3) and started reloading. Looking at the dies one would think that the reloading process would be significantly different. On the contrary, I actually found the process a little easier with these dies. The sizing die contains a polyurethane spring that assists in removing the case from the die. The spring-action is counter-intuitive to my typical method of reloading, but I got used it after about a dozen rounds. That small spring effect also gives the bullet a little push, improving the ease of the resizing. Spent NAS3 casings next to freshly loaded rounds. Note the purple magnet; these are very easy to pick up at the range. I also think it is important to talk about the NAS3 casings as well. Unlike normal brass, each casing is actually two pieces fused together. Engineered to be 50% lighter and 2x stronger than brass, it ejects cool to the touch and can be picked up with a magnet. 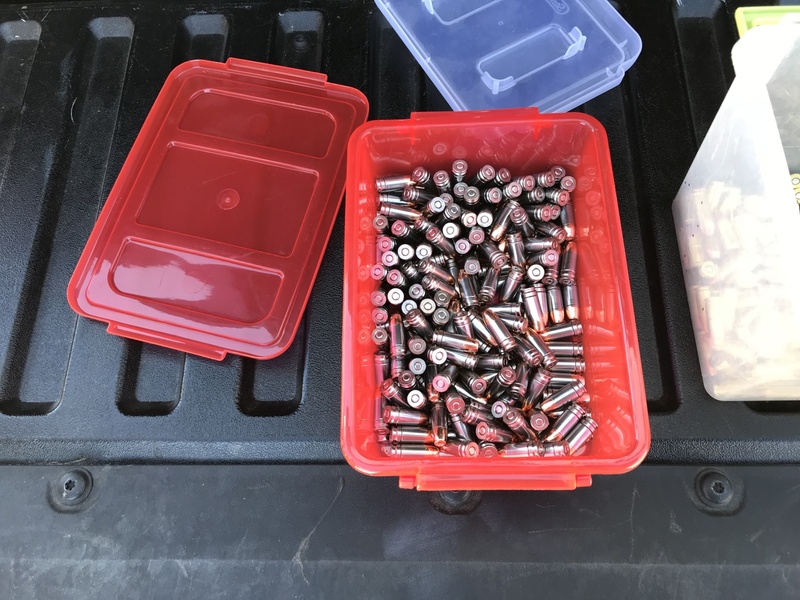 This makes picking up your brass much easier at the range, which is especially good since you will want to recover these casings for repeated reloading with the S3 Reload. While the expander die does look a little alien, I actually like the design more than traditional expanding dies. Since I was given a big bag of brass I figured the few I butchered getting the process down was the price SST was willing to pay. However, to my delight, I did not over-expand a single case! Some foreign manufactured brass casings have unusual internal dimensions, and those should be avoided with these dies. SST dies WILL work on traditional brass cases, but SST cases CANNOT be used with regular dies. As a test, I loaded 20 brass cases I had on this set with ease (all of which also fired just fine). During my review, I had some questions about the S3 Reloads and “best practices” for using them, and I reached out to SST and spoke with “Volo” (pretty sure he is one of their engineers but forgot to ask). During the call, he told me has loaded shells up to 30 times (all at normal pressures, no +p’s, or any other “hot loads”). Though the cases are rated for them, hotter loads will wear them out more quickly. He also mentioned that case wear is shown in the stamp in the case head soonest. So make sure you are checking that as part of your inspection process. Biggest problem? Not using enough lube. I think we have all ran into that one time or another. :). After I dialed in the appropriate amount, everything operated smoothly. I was also told they are soon releasing other calibers, some even in the high powered rifle arena (.308 Win) which is definitely of interest to this author. It will be interesting to see the life cycle of those cases and if they are able to withstand twenty (or more) reloads. One of many containers of rounds this author loaded for testing. I initially loaded 50 rounds and fed them through my Sig P226 without issue. Then I invited a buddy out to shoot with me. 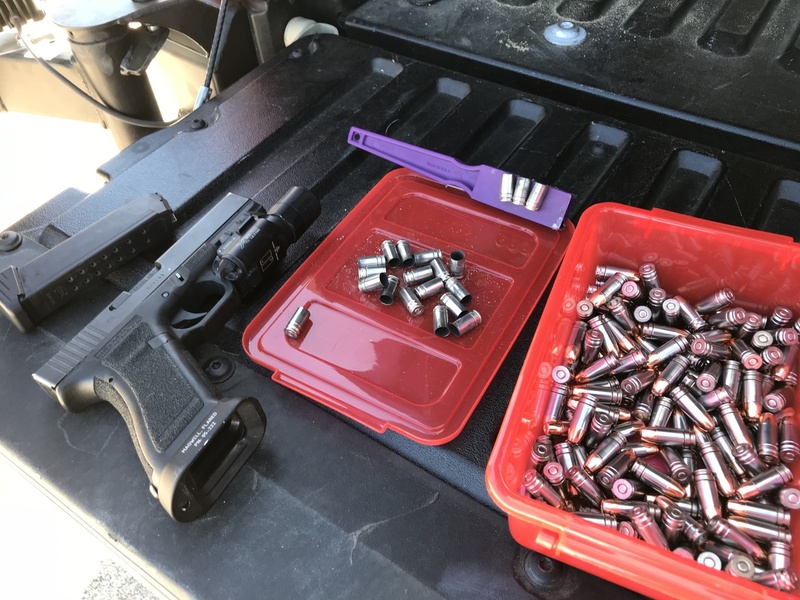 We ran through a large Tupperware container of 9mm and didn’t have any problems. The combination of the S3 Reload dies and NAS3 brass seems like a really decent combination, and the ability to also load regular brass is great. I like the quality of Shell Shock’s products, and I was very impressed with their staff willing to stop their work day and spend 30 minutes to talk to me. I will continue using the dies and SST cases (until I wear them out) and recommend you give them a try if you reload. Shell Shock also provides specialized dies for sizing and decapping and belling. [su_dropcap style=”flat”]W[/su_dropcap]e live in an age where all types of novel ammo and reloading components are coming to the market. That is good news for shooters, as many of these products are legitimate improvements over previous offerings. One company, Shell Shock Technologies, has recently released 9mm cases using manufacturing methods not previously used, at least to my knowledge. What sets Shell Shock apart is that the company produces a two-piece case made from nickel steel. The exact process is proprietary, therefore the methods used are not revealed. However, I recently received some cases for evaluation, along with a sizing and decapping die and a belling die so I could load and shoot them. The bullet seating is done with a normal die, which isn’t included. The sizing and belling dies can also be used for standard brass cases, which is a plus because these new cases are superior to brass but will never replace them. According to company literature, the cases are 50 percent lighter and two times stronger than brass, with a uniform wall thickness and proprietary assembly technique that leads to reliable and consistent velocity. The bottom of the case is an aluminum alloy, while a steel part is the top, which makes the case magnetic and makes it easier to pick up at a range. I placed a number of them on the scale one at a time, and they all weighed 35 grains, with no variation. Some brass cases I weighed came in at 63 to 64 grains, so the advantage of lightweight cases would be evident if you had to carry a large amount of ammo. I also measured several of the Shell Shock cases for length and they all came in at .7505 inch with no variation. Obviously, no variation in weight and length among these cases would contribute to accuracy and consistency. Measurements confirmed that Shell Shock cases are consistently uniform in both size and weight. I also received 200 rounds of 9mm loads with copper 124-grain HP bullets. These are produced by L-Tech Enterprises using the Shell Shock cases, and they sent some info showing penetration and weight retention results. They are consistent in size and weight as well, so if you are not a reloader, this ammo might be for you. A top view looking into the cases. FOR THE FIRST LOAD, I used ﬁve grains of Winchester 231 and a 115-grain FMJ bullet. This load is very mild and the cases were covered with soot, which is normal with light loads. Low-pressure loads don’t completely seal the chamber, which allows some powder to come back into the action. While messy, it is seldom an issue in regards to performance. The soot cleans off easily for those who like good-looking cases. Most nickel cases have that advantage, though brass needs extra cleaning if that is important to you. So why would you purchase these cases as opposed to more conventional pieces, when most 9mm cases last several ﬁrings and are easy to obtain? Performance-wise, there isn’t any big difference. But if you wanted to carry a large amount of ammo, the lightweight case really adds value, and if you combine this case with a lightweight bullet, then it would be a really desirable product. Liberty Ammunition makes a 50-grain nonlead HP bullet, and that paired up with the Shell Shock case should make some top-rate ammo. Carrying a small amount of this ammo wouldn’t make a difference, but carrying or transporting a large amount would show a sizable advantage. I have a 60-grain bullet to work with, and at high velocity it should make a nice self-defense load. I sized some ﬁred cases with normal dies and don’t see any problems, and the effort is the same as with the special dies; belling is normal and priming feels a little odd. I tried some once-ﬁred cases using both sets of dies and the effort appears identical, though lubing makes them easier to size. I noticed that a couple had increased the size of the groove, but I’m not sure if that is a function of the dies or a case. If you closely look at the groove, it shows that the case is a two-piece case. The inside is slightly shallower than a conventional case, but not by much (an average of .05 inch). A look at the inside of the custom die shows that it appears to be the same as a conventional one with a tungsten core. It appears that the construction of the case is very different than a conventional piece of brass, and it will be interesting to see how they go through a Dillon or other progressive press. I am going to load cases with the same load but using both sets of dies. I have some 60-grain HP and had to size the new cases to make them ﬁt tight enough. The 115-grain cast did not need to have the new cases sized. For testing, I used a Beretta with a 5-inch barrel, a SIG with a 4-inch barrel and a Norinco, giving us different guns to provide more info on what to expect with the cases and loads. Some of the cases have now been ﬁred seven times; there is no indication of any problems, and I am using RCBS dies only, as I don’t see a need for the special ones. That would make these cases even more desirable if it isn’t necessary to use special dies. Obviously, you should test their dies to see which method works best for you. Testing was conducted using a Beretta (bottom) and a 9mm long-slide Glock, as well as (not pictured) a Norinco. I RECENTLY RECEIVED SOME new powders from Chris Hodgdon that resemble some older powders such as Red Dot. Since I received the powders from Hodgdon while trying out the new cases, I decided to try a couple loads with the Shell Shock cases, starting with the Red. In these tests, the cases held up after ﬁve or six ﬁrings using standard RCBS dies. I tried many loads using the three handguns I mentioned to get a good overview of the case, along with the new powder and a variety of bullets. I made some of the lighter bullets myself (such as the 60-grainer), as they are not generally available. The Acme bullet is a cast item with a red coating that tends to make them slick and aids in feeding. These numbers were rounded off, and you can see that if you needed to carry a large quantity of ammo, the Shell Shock cases would cut down on the weight enough to make a difference. The 60-grain CMA fared best, but still jammed on occasion in the Norinco. Of course, that would render it unsuitable for defense work, but I will try and work with the ogive, though due to the short length that may be difficult. The 147-grain Berry did well with the heavier load of Hodgdon’s HS-6 with no stovepipes. Like any situation and gun, it is recommended that you thoroughly check out the ammo that is intended to be carried. I took the 135-grain CMA and changed the ogive to a more rounded shape to ensure that it will feed in everything. In addition, they were .354 in diameter and the reshaping increased it to .358. Since there is a possibility that they may cause some problems, I reduced it to .356. Some .357-diameter bullets (a FMJ and a cast coated, both roundnose) were swaged down to .356. The purpose is for subsonic loads. A company called Liberty Ammunition makes some high-performance ammo using lighter than standard bullets. The 9mm bullet weighs 50 grains, so I measured a loaded round. The Shell Shock case weighs 35 grains, so a loaded round with a Liberty bullet would weigh 85 grains. Several companies are currently using Shell Shock cases, and I would like to see Liberty pick them up with their 50-grain bullets. I was also curious as to the case capacity of Shell Shock casings compared to other commercial cases. I used Winchester 572 ﬁlled to the top on each case and the results surprised me. I thought that the Shell Shock case would have more capacity based on their weight. My “nonscientiﬁc” results showed Shell Shock and PMC held 13.1 grains, Federal and Winchester 13.2 grains and GFI 13.3 grains. As you can see, they are very similar. The next step is to use the same load in both types of cases. ONE THING I HAVEN’T NOTICED is any mention of the cases being reloaded on a progressive machine. That would be a plus, if that is the case. Therefore, I had a friend run some through his Dillion 550. Other than the requirement that they be lubed, the process went off without a hitch. With a normal bullet everything went ﬁne. We ﬁred some of the rounds made on the Dillon and they fed ﬂawlessly, so there should be no issues but they have to be lubed regardless of which dies or machine is used to load them. That would be the only downside. That new powder W-572 seems to work well in the 9mm rounds; you just need to adjust the loads. Here is some L-Tech factory ammo with Shell Shock brass, in this case, a 124-grain bullet. These two-piece steel and aluminum ammo cases from Shell Shock Technologies were a hot topic at the most recent SHOT Show. During my initial try at black-powder, cartridge-rifle silhouettes, the first person I met was Beth Morris. She was the match manager who greeted us, accepted our entry fees and also presented the awards after the shoot. Those tasks would keep any person well occupied; however, during the match was when she really got busy. Beth is a real shooter: She uses Model 1874 Sharps rifles in “buffalo” calibers, and her stocks are decorated with entry stickers from her many competitions. Those stickers are the real marks of experience, but don’t let me suggest that Beth is the only woman to shoot in those matches, because there are several ladies who compete (and hunt) with black powder rifles. You can find ladies shooting in silhouette and long-range matches, as well as the famous Matthew Quigley buffalo rifle match in Montana this month. As a lady Sharps shooter Beth isn’t alone, but she is outstanding. At a recent match, (left to right) Heather Ochoa, Beth and Diana Mitchell did some great shooting. Heather was the high scoring lady of the day. The real start for Beth was when she pitched in to help her husband Steve with his bullet casting and reloading. Steve started competing in black powder cartridge rifle (BPCR) silhouette matches 15 years ago and had little time to prepare the ammo the way he wanted it. That’s when Beth learned how to cast bullets and, as she says, one thing led to another. Her next step was spotting for Steve while he was shooting. A spotter watches for bullet impacts to let the shooter know if any sight adjustments need to be made. Spotting, of course, is done with powerful scopes that can see the bullet’s impact from well over a quarter of a mile away. Their first BPCR match was at the Powder River Sportsmen’s Club in Baker City, Ore., and both of them quickly got hooked on the sport. Beth’s boss at the time was also competing and they would have lengthy discussions at work about reloading, ballistics, reading and calling wind conditions, plus everything else related to long-range, black-powder-rifle shooting. Beth would then share this knowledge and expertise with Steve. Beth then got involved in the testing and load development for Steve’s Sharps .45-70. Even though she had only shot a rifle once in her life previously, she started thinking about doing some of the shooting herself. So, after one of the matches she fired her first shot with a black-powder, single-shot Model 1874 Shiloh Sharps in .40-65. On her second shot she knocked down a pig silhouette at 300 meters and was hooked. Steve and Beth Morris are a black powder couple through and through. Steve was certainly excited about Beth’s shooting, although he might have been a little worried about the extra work it involved. She told him she would start shooting under two conditions: She wanted to do all her own bullet casting, reloading and load development so whatever she achieved would be her own accomplishments from start to finish. She depended on Steve’s support and advice, but she wanted to do the work. The second condition was that if she felt at any time her shooting adversely affected her husband’s enjoyment or ability to compete in the matches, she would quickly quit. Luckily, it turned out to be a great experience for both of them and something that they share a great passion for. Beth Morris with her Hartford model .45-70 equipped with a 30-inch heavy barrel, Montana Vintage Arms front sight and long-range Soule rear sight on the tang. She named it “Freebie” because her husband Steve won it in a drawing at an Idaho State Rifle Match. Beth began looking for her first black-powder-cartridge rifle and decided on a .40-65 caliber Pedersoli Rolling Block from Dixie Gun Works. She shot in her first silhouette match with that rifle in September of 2002 and reached a score of seven hits out of the 40 targets. Frankly, that isn’t a bad start, and by December of the next year she was shooting in the NRA AAA Class, which generally means she was hitting 26 to 30 targets out of 40, almost a master-class shooter. Between relays, Beth cleans her rifle. Note the colored match entry stickers on the stock. Now, Beth shoots three different .45-70 rifles, all Shiloh Sharps Model 1874s. Beth gives her rifles names, and that to me is revealing because it means she recognizes how each rifle can have a character of its own. We might say that people who name their guns know their guns the best. Her first rifle is named “Freebie” because Steve won her (all of Beth’s rifles are ladies too) in a drawing at the Idaho State Match. She is a Hartford Model .45-70 with a 30-inch heavy barrel, Montana Vintage Arms front sight and long-range Soule rear sight on the tang. This rifle is also fitted with an MVA 23-inch 6-power scope with a 4 minute-of-angle aperture reticle. Freebie is Beth’s all-around gun for iron sights and scope classes, and she has helped her win several NRA national titles while setting several women’s records. Beth uses Freebie mainly for shooting with a scope, and has fired over 16,000 rounds through her. Beth squeezes off an offhand shot while Steve “spots” her shots through the scope. Beth’s second rifle is called “The Ninety.” It started out as a .45-90 lightweight hunting rifle, but they sent the gun back to have it fitted with a heavy 30-inch barrel chambered in .45-70, half-round, half-octagon. With this gun, she also uses a Crossno .22-caliber barrel liner for practice, and with the liner she also competes in BPCR .22 long-range silhouette competitions. Those Crossno liners are accurate, and with that combination Beth won the “High Woman” award at the national matches in Raton, N.M., in both 2009 and 2010 as well as the Oregon State .22 Iron Sight Open Championship in 2013. Beth achieved her Master Class in .22 Long Range Silhouette competition with The Ninety in 2013. “Surely” is the name of Beth’s third Sharps rifle, and it’s very special for several reasons. The only time the NRA Nationals, held at Whittington Center in Raton, ever awarded the Shiloh Sharps rifle trophy to a High Woman Champion was in 2008 when this rifle was presented to Beth Morris who used Surely for the competition. Surely is a .45-70 Model 1874 No. 3 Sporting Rifle with a heavy 30-inch barrel. It is equipped with an MVA front sight and midrange Soule sight on the tang. Beth named this rifle Surely in honor of her mother, Shirley Merrin who passed away after a brave battle with cancer. During her first silhouette match in 2002, Beth Morris scored seven hits out of the 40 targets. That wasn’t a bad start, and by December of the following year she was shooting in the NRA AAA Class, which means she was hitting 26 to 30 targets out of 40, almost a master-class shooter. In 2009 Surely helped Beth achieve her highest finish at the Nationals in Raton. That year Beth finished 5th overall out of 182 shooters, and she won the AAA Class and was the high-scoring woman in both the scope and iron-sight classes. All three of Beth’s rifles have added custom pistol grips that Steve makes out of black walnut. Those grips allow for more control, especially in offhand shooting. Steve also adjusts the trigger pulls on the set triggers of Beth’s Sharps rifles so that all three have a very similar light pull. That allows Beth to switch from one gun to another without any real difference in the feel of those rifles. She says she is very lucky to be married to her gunsmith. Beth is seen here with “Freebie,” one of her three Sharps .45/70 rifles. When inspecting cases (new or used) make sure the necks are not out of round or oversized, as seen in these example. Although rare, defect do occur. All cases should be visually inspected and that includes new ones. I have bought a lot of cases from various brands and there are occasionally defective ones. While not common, they do exist and should be discarded. When in doubt, throw it out. This .303 savage case shows what a split neck look like. You should always be in the habit of constantly inspecting cases. Sometimes it might look good, but when you size it a split occurs during the procedure, and if you miss that, then you will have loaded it for nothing. A split neck case can be fired, but will generally be inaccurate and inconsistent because the neck can’t grip the bullet properly. New cases can be out of round and/or oversized. Part of that comes from shipping when they are banged around. After sizing, I take an RCBS very low drag (VLD) tool and ream the inside of the casing’s necks. This helps seat the bullet and keeps it from catching on the sides of the case. This is especially important with some flat-base slugs. I feel that this also adds accuracy and consistency. Sometimes, I’ll even create a cannelure, which is a groove that I crimp a little to aid in feeding the bullet. All revolver ammo should be crimped, especially with the heavier loads. Failure to follow this rule will usually result in the bullet coming out and tying up the cylinder. Here is an example of a case subjected to too much headspace in a firearm. This caused the case to separate. Clearly, this should be thrown away and not reloaded. Fired cases should be inspected prior to any other procedure. This is really important if you pick up range brass. There may be a reason someone discarded their brass rather than take it home. Before inspecting, you should clean your cases. There are several ways to do this. I use a Dillon case cleaner with crushed walnut hulls and some cleaning liquid. A couple of hours in there and they come out looking great not to mention defects are easier to spot. You may encounter cases with Berdan primers, and we will talk about this in a minute, or some that were shot with a load that was too hot. This will produce swelling and should be discarded. If you see a shiny ring about a quarter of an inch above the rim, that may indicate excess headspace in the gun that fired it. One of the most common problems is a split neck. Cases that are heated and cooled over and over cause them to be brittle and the only way to combat that is to anneal them. This means softening the case by heating it. This isn’t practical with common cases, unless you have more time than I do. The Berdan primer is generally used in foreign military, as well as some commercial ammo. It can be reloaded, but you also need special tools, and as a rule it’s more trouble than it’s worth. In a later installment I will go into more detail on this. The standard American primer is the Boxer, which has a flash hole in the center of the case and is much easier to work with. When a round is fired the case expands, so when you are reloading, the cases have to be resized. All die sets, which we talked about in Part I of this series, have what is known as a sizing die and which accomplishes this task. If you buy new brass, it normally doesn’t need to be fully resized, though the neck may need to be squared. The neck of this case was too small when the bullet was loaded, causing the collapse of the case neck. After you size the case, you will need to check for proper case length. Cases stretch during firing and sizing, so you should lubricate the inside of the neck, especially with bottleneck cases. If the case is too long, it might be hard to chamber or even cause a dangerous buildup of pressure in some instances. It could also have an affect on accuracy. If you are just doing some informal shooting, mixing brands of cases won’t cause any harm. Some people may disagree with that, but mixed cases work well, as long as they are in good condition. For more serious purposes, such as a big-game hunt, I will segregate the cases by brand and the times that they were fired. The other stuff is used for sighting-in or practice. I’ll run all of my hunting ammo through the chamber and magazine because it’s easier to fix the problem at the shop than in the field. Serious target shooters sort their brass out by lot number, weight, size of the flash hole and other factors that might effect accuracy. They measure groups in the thousandths of an inch, so they have to be more particular than the rest of us. If there is a defect in your case, then your ammo will be poor, not work at all or be seriously dangerous since they might rupture. Cases must be able to withstand the pressure of being fired, which can run from a few thousand pounds of pressure per square inch to 65,000psi. Among many possible flaws you may encounter in casings here is a 12-gauge shell where the extractor has cut through the soft brass case. After you have checked out everything, then you are ready to prime. The primer should have some feel going in, and if it’s too loose, you might want to discard the case. Loose primer pockets are generally a result of hot loads, which will stretch them beyond usefulness. Sometimes soft brass will also cause this problem. The primer should be seated about .002 inch below the head and be flush with the case or you will have another set of problems. If the primer is too tight, you either have a dirty primer pocket or perhaps a military crimp around the primer pocket. Either problem will have to be resolved prior to seating it. There are plenty of tools out there to resolve these problems, but I ream out military-primer pockets as opposed to swaging (a process of bending or shaping cold metal), as this works better for me. If a pocket is dirty you’ll need to clean first. While this may seem like a small detail, improperly seated primers can ruin good ammo. After priming, it is time to seat your bullets. There should be some resistance when seating so the bullet stays in the case. A bullet that is too loose will either come out or cause an inconsistent ignition. This problem can be caused by a bullet that is too small, a case neck that is too thin or an oversized expander plug. If the bullet is excessively tight, it may not seat at all and will cause other problems. In a later installment in this series we will get into expanding and various types of crimping. Your loading station should have a sturdy table to mount your press and other equipment, which can be quite heavy, and lots of shelving for easy access to all of your loading dies, bullets and powder. I suggest a table that is at least 6 feet long. If you’ve decided to start handloading or reloading your own ammunition, there are some basic things you’ll need to start your new hobby. Space is one. Find a place you can dedicate to just loading. It can be a spare room or the corner of a garage, so long as you have space with good lighting. Your loading station should have a sturdy table to mount your press and other equipment, which can be quite heavy, and lots of shelving for easy access to all of your loading dies, bullets and powder. I suggest a table that is at least 6 feet long. A rifle casing, gun powder or grain and projectile or bullet. Once you have your work area set up, it’s time to buy your equipment. There are many different types and price ranges for each respective need, so it will behoove you to take some time and shop around. Most people get into loading to save money on their ammunition, and you will, but you will still have to make an initial investment on the equipment and supplies. The purpose of the press is to hold the dies, which are needed to process the ammunition. Star progressive reloader press uses leverage to push the shell cases into the dies that perform the loading operations. Progressive loaders have several different tasks going on at the same time and you may miss an important step, potentially causing a batch of bad and dangerous ammunition. The purpose of the press is to hold the dies, which are needed to process the ammunition. It uses leverage to push the shell cases into the dies that perform the loading operations. The press needs to be securely mounted to the table so the cases can be resized. This takes some effort, especially with rifle ammunition. There are a variety of options made by various companies such as Lyman, Hornady and RCBS, Lee and Redding, and they all make great presses. If you are a new loader, I would recommend a simple, single-stage press. There are progressive presses that are for multi-stage cases, but if you are not familiar with loading, they can get you into trouble. Progressives have several different tasks going on at the same time and you may miss an important step, potentially causing a batch of bad and dangerous ammunition. If you are serious about loading, I would recommend a heavy-duty model because you can load both rifle and handgun ammunition. Loading is a precise operation and trying to use the wrong dies will not work. A die is a specialized tool used to cut or shape material using a press. Any caliber that you load is die-specific. For instance, if you want to load .40 S&W ammunition, you need that specific set of dies. Loading is a precise operation and trying to use the wrong dies will not work. If you are loading a modern straight-case, then I recommend carbide dies. Not only do they make sizing easier, you won’t have to lubricate your cases, and they last forever. A powder measure and a set of scales are necessary to put the proper amount of powder into your cases and are vital in creating ammunition that is safe and reliable. This is where the manuals come in handy. You can look up the caliber you are loading and get the proper type and amount of powder necessary. This data was developed by professionals and should be followed closely. Other tools you may need are screwdrivers, Allen wrenches, possibly a lube pad, vernier caliper and a bullet puller. Overall, you are looking at a $400 investment, plus the cost of supplies. This will get you started. Having a variety of manuals come in handy. You can look up the caliber you are loading and get the proper type and amount of powder necessary. This data was developed by professionals and should be followed closely. Vernier calipers are used to measure case length. If you load rifle cases, there are other tools you will need such as a case trimmer to trim the stretched cases and a vernier caliper to measure the length. It is very important that your case be the proper length, so don’t overlook these items. You will be able to consult a loading manual for the proper length. Also, when loading rifle cases, a lube pad is necessary because if you do not lube the cases, one will get stuck in the die and this is a real headache to remove. You will also need a brush to lube the inside of the case neck. In the next installment, I will discuss the importance of all of these steps.